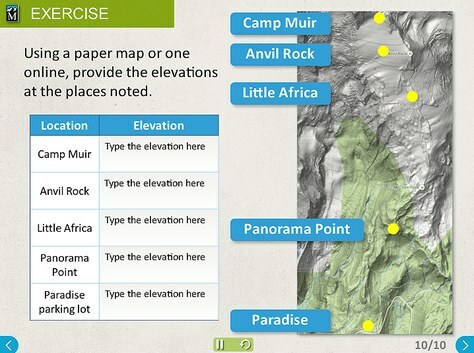 You are here: Home / Blog / What’s next for Mountaineers eLearning? As part of our Progressive Outdoor Education initiative, The Mountaineers is investing in eLearning to complement our existing courses. Our successful pilot with Wilderness Navigation in 2016 showed us the value of eLearning in improving the delivery, impact, accessibility, and consistency of our courses. We will begin to offer a variety of eLearning courses using the latest tools in eLearning technology. You can look forward to: interactive lessons, games, live sessions, and online discussions. Aimed at both newcomers as well as experienced members of The Mountaineers, our eLearning courses will enable you to learn basic concepts, develop new skills, and improve your techniques at your own pace, all from the comfort of your own home or through an electronic device on the go! Some of our eLearning courses will complement our existing classroom curricula (which should come as good news to many of our busy volunteers), helping to address limited space and class availability issues. Our standalone eLearning courses will reach out to geographically dispersed outdoor enthusiasts and hopefully create a new generation of advocates. Another advantage to having eLearning platforms is that it gives us the opportunity to reach out to culturally, linguistically, and ethnically diverse groups of the Pacific Northwest. This aligns well with The Mountaineers' goal of creating an inclusive community. The eLearning Department is currently focused on creating lessons to address core concepts such as “Low Impact Recreation Skills”, “How to Become a Mountaineers’ Leader”, and “Permitting 101”. Our goal is to work with all of our branches and create meaningful, engaging, and high quality eLearning lessons that will benefit current and future Mountaineers for years to come. It is our sincere hope that you will join us as an eLearning volunteer and be a part of these efforts. We need your help, expertise, and ideas! By completing the following forms, you can submit your ideas for new courses or sign up for our volunteer roster. I really loved the e-course for navigation. I wish I still had access to it for review! The interactivity, ability to go at your own pace and learn things in digestible pieces is excellent.